Yes, I live in Utah, the Beehive State. You’d think that our state symbol, the beehive, might have something to do with honey, but no. It’s all about early pioneer industry. The thing is, Utah is not really a major player in honey production – not by a long shot. Last week I was lucky enough to be a part of a farm tour hosted by Talisker and its executive chef, John Murcko. We covered more than 300 miles visiting some of northern Utah’s purveyors of local goods. Along the way, Slide Ridge Honey master Martin James and his family hosted us for their “daily staff lunch,” a magical homemade interlude served next to a garden, under shade trees just a stone’s throw from pallets of honey and vats of soon-to-be honey wine. They dished up soft fresh rolls with a silky, runny honey butter, a salad with Slide Ridge Honey Vinegar dressing and then plates of pot roast, carrots and mashed potatoes. And for dessert, poached pears, homemade salted caramel ice cream and glasses of viscous, amber Slide Ridge CaCysir Honey Wine, just released. Look at those gorgeous legs. The wine, priced just under $25, has just been released in a few of Utah’s state run liquor stores, including: Snow Creek (Park City); Logan, Ogden-Wall St.; Holladay; Springville; and Hurricane. BUT, I encourage you to ask for – OK, demand it? -- it at every big state wine and liquor store you visit – if this is your sort of delight. The supply is not huge, but the demand ought to be. 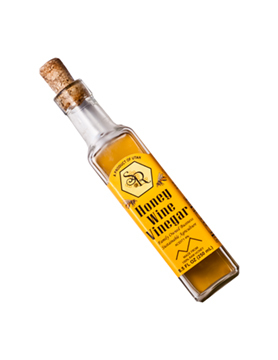 As for condiments, Slide Ridge’s Honey Wine Vinegar is more widely available. A balance of sweet and tang, it is, of course, great as salad dressing but also consider tossing a tablespoon over a bowl of oven-roasted, caramelized Brussels sprouts or deglazing a pan after browning pork chops, or head to The Farm or Bistro at Canyons and find out what magic Talisker chefs are creating with it this summer.